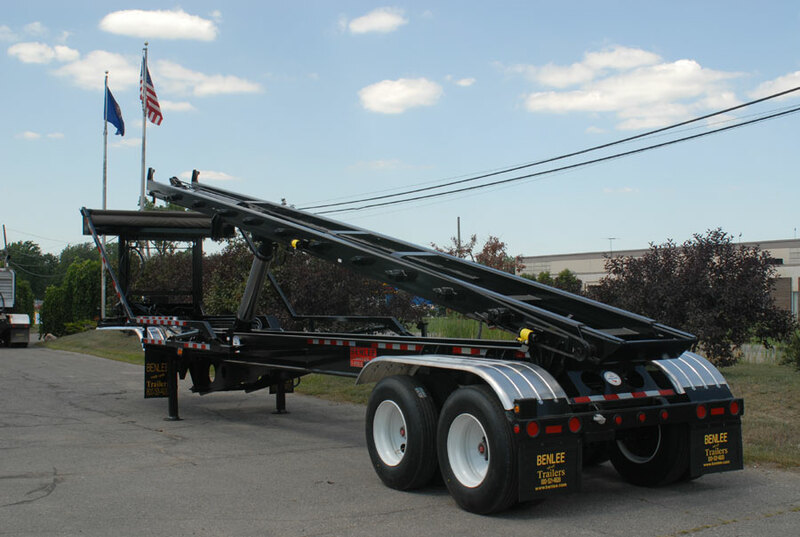 Lugger Truck Manufacturer BENLEE is now the leader in Lugger Truck manufacturing, when we acquired the leading lugger hoist manufacturer, Huge Haul. BENLEE has been a leader in roll off trailers for decades and now with adding the Huge Haul product line to the BENLEE family, we can now support Lugger customers in Chicago, IL, Detroit, MI, New York, NY, Toronto and more! BENLEE and Huge Haul are known for great products and now you can get them from the same team. Just call us at 734-722-8100 for a quote! Roll off trailers have many applications in scrap metal operations. This is a great unit that when put behind a power unit (tractor) is only about 12″ longer than a straight roll off truck. It carries the same 20, 30, 40 yard boxes as a straight truck, but due to the way it pivots, it gets into a tighter spot than a roll off truck. With FET, it costs about $45,000 and in most states carries about 50% more weight than a roll off truck. Great roll off trailers that with only two axles has a Federal Bridge of 80,000 GVW and can carry 80 yard boxes, yet it only weighs 17,500 lbs.! Roll off trailers that can be over permitted and with its three axles is also 80,000 GVW. A family of roll off trailers! Hydraulic Hose Repair and Replacement at BENLEE, a Detroit area repair shop with every hose and fitting! Hydraulic hose repairs and replacement can be done while you wait at BENLEE. We have every hose, fitting and size you need to replace Parker, Weatherhead, Aeroquip, Eaton hoses. NEW AND USED TRAILERS IN STOCK FOR DELIVERY THIS YEAR. At BENLEE we realize that the business climate is changing and things are moving at a faster pace. With that in mind we have made the commitment to stock more Trailers. We now stock the Super Mini, BridgeMaster, Conventional, Two Box, and Open Top trailers for same day shipment, or same pick up! The Super Mini is our most popular roll off trailer so we are stocking 3-4 units. At the price of only $45,975, the Super Mini is truly a roll off truck replacement. When hooked to a standard tractor it is less than a foot longer than a roll off truck, but because it pivots it gets into a tighter spot than a roll off truck. If you don’t believe us you can try one through our rental program and we will even help with the rental cost! For 1/3 the cost of a new roll off truck you can have a more versatile, longer lasting, heavy duty roll off truck replacement that can also carry almost 50% more weight legally in most states. Our BridgeMaster is a 40′ tandem axle roll off trailer designed to payload as much as possible and run legal at 80,000GVW. It can carry up to an 80yd container and payload up to about 20 tons! We are now stocking these units for delivery so you can have it today! 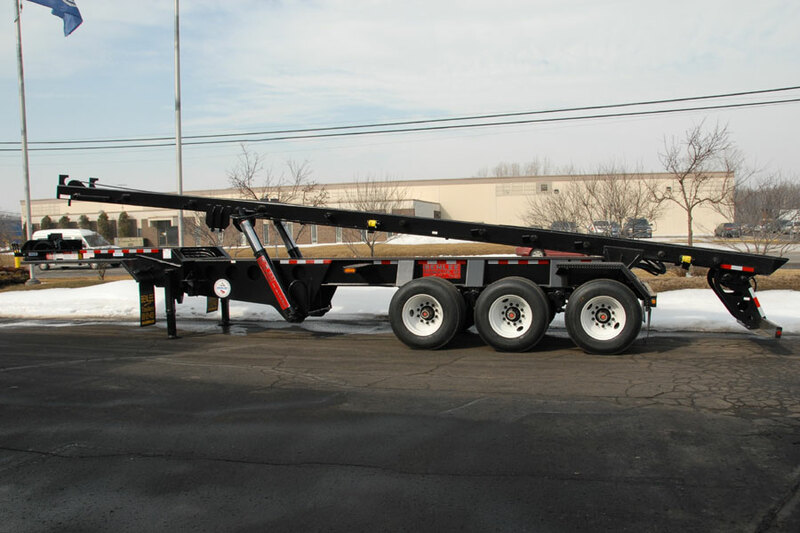 The 40′ tri axle Conventional roll off trailer is the workhorse of the industry and can pick up extremely heavy loads. It can also carry up to an 80yd container and can be over permitted in certain states. If your application involves very heavy loads then the Conventional line of roll off trailers will suit your needs. The BENLEE Two Box roll off can carry 2 containers up to 24′ long. What makes this trailer unique to others is the container transfer system which makes is quicker and easier to operate, and has lower maintenance (less cable replacements) costs than other units in the market. Also, the low tare weight allows you to carry more weight per trip. Our Open Top trailers are available in lengths from 40′ to 53′ and with side heights from 4′-8′. Our stock unit is 48′ long with 8′ sides and constructed with all Hardox ™ steel for maximum strength and low weight. This allows for a lower tare weight for higher payloads and longer life. At BENLEE we know the waste industry, scrap metal industry, environmental industry and demolition industry, so we build our trailers to last!